Jamaica is blessed with stretches of enchanting sand, suitable for every kind of runner. A great way to train for any run is by running along Jamaica’s beautiful coastlines. The benefits of running on sand are endless. A runner can burn up to 80 calories more per mile running on sand than on hard surfaces, without the associated wear and tear on joints and bones. 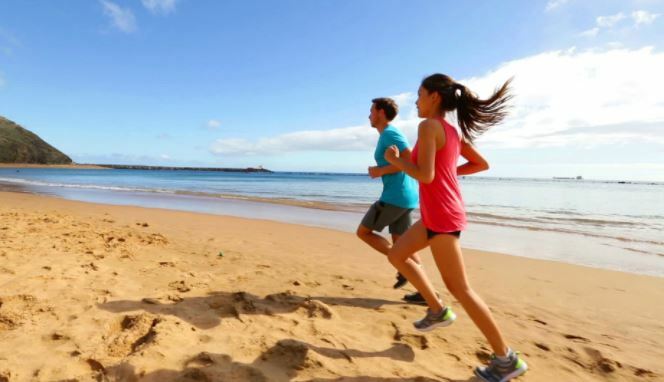 The beaches of Jamaica are always a fantastic place to enjoy a run -here are some tips for running on sand at Couples Resorts! Some beaches have more slanted surfaces than others. Depending on your level of fitness, running on an angled surface can wreak havoc on your knees and hips. Whether your run across the foreshore or backshore you must choose the section of beach that offers the right conditions for you! Running over tightly packed, wet sand allows the runner to pick up the pace and eat up some sea-level miles. For a more challenging workout, there is nothing like running through ankle-level sand. The coarser sections of beaches force runners to work harder, building solid calves. Make sure to drink plenty of water to avoid dehydration. The lack of shade on the beach will affect the distance and speed that you will run. It is a good idea to hydrate before your run, as well as to carry a water bottle with you too. Jamaica is known for being paradise on earth. What is great about running along its coastline is the stretch of land you can cover in such as small amount of time. Don’t just worry about mapping your run, try to enjoy it too. Make sure to glance to your right and left so see Jamaica’s stunning mountains, crystal blue waters and magnificent wildlife. Share a friendly hello with a local to make your day that bit brighter. Sunscreen is a must for every runner, especially those running on the beaches at Couples Resorts. There is typically little to no shade on the beach, so it is important to protect yourself from the harmful rays of the sun. Remember that water and sand reflect rays, so extra sunscreen is essential when running along the shore. For those more prone to sunburns you may prefer to wear a lightweight, long-sleeved shirt. A hat is great for shading your face and neck and sunglasses will protect your eyes. Cooling down after running is very important for your heart and the recovery of your muscles. What better way to cap an invigorating coastline run than by diving into the water to cool off? A handful of Jamaican beaches are notable not only for their running qualities but also for their post-run attractions. We hope you enjoyed our tips for running on sand. If you considering a trip to Couples Resorts, contact a member of our team to find out more about our latest offers.